Mom's Gone Bronson! 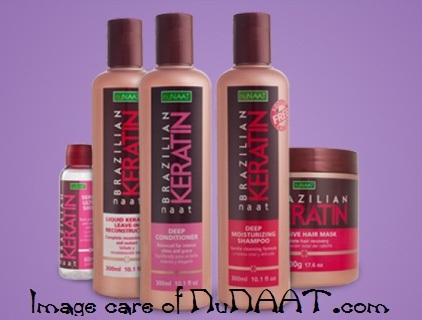 : NuNAAT Brazilian Keratin Product Review! Over the past several weeks I have given up my "regular" shampoo and conditioner and switched it out for NuNAAT's Brazilian Keratin line! I was a little overwhelmed at first as using so many products but wanted to give this a true test and so threw myself in at the deep end from day one [all of the signs for a good experience were there from the start] and I was ready to go! But before I talk about my experience, I want to let you know that all of the products in this rage are meant to work with all hair types to repair cuticle damage, strengthen hair, restore shine, reduce frizz and volume and to protect your hair from the elements. It should also be noted that there are no formaldehyde or sodium chloride elements in these any of these products and there for they are a little easier on your health, too! Again, before I get started, I should say that my hair is long - well past shoulder length - and thick! My hair is also wavey AND frizzy and so there is no getting around the fact that I do need to do a lot with it to make it look the way you might imagine seeing it sitting pretty there a-top of my head throughout the year and many changing seasons! I first took to the shampoo and conditioner as I usually would and just switched out the regular brand I had on hand at the time and washed as per usual. The entire line is designed for daily use and so these became my new daily shower weapon of choice alongside a treatment once a week of the intensive hair mask instead of the regular conditioner! The hair mask was just a delight, I have to say! It really worked wonders on my hair and scalp and it wasn't messy or awkward to apply either! I just shampooed as usual but applied the hair mask after rinsing and left it for a little while before washing it through! As I mentioned before, I have crazy hair and usually end up having to get it straightened to keep it looking nice and sleek! To aid in the straightening process I switched out my regular sprays for the leave-in constructor, which is a very light liquid applied after washing and towel drying but before blow drying or straightening! The reconstructor penetrates the hair and is sealed in when straightening! The reconstructor is made for regular use and can be applied each time you style for the desired effect, which can be finished off with the ultra-shine serum, which you can apply to wet or dry hair to give your hair a layer of protection from the elements, and which I have found useful when used during the hot, sticky summer months to keep my hair from losing that styled look and reverting back to a ball of frizz!! I have to admit that I was skeptical as to whether these would work for my hair as I have used products with Keratin in them before and have been left with dry, unmanageable hair, which has lead me away from that particular store-purchased brand that I shall not mention, but which I had hear had worked very well for others and so I do know that what sounds great for one might not always be right for me! HOWEVER! Overall, these particular Brazilian Keratin products from NuNAAT work superbly together for my hair and I have been left with soft, smooth and manageable hair that [for once] has not been afraid of the summer!! They also smell great and do not leave a sticky residue either! As a complete set I have been nothing but impressed and it isn't too easy to impress me with hair products and so when you see me tell you it works for me, I mean it - and with a happy dance to boot! I would encourage you to try them as a range rather than one or two items at a time for the full benefits you may get on your hair and I would LOVE to hear from you if you have had any previous success with similar products or with NuNAAT themselves!! If you would like to find out more about these products in particular, and about NuNAAT, you can head on over to their website and find them, HERE and then head on over to Twitter and follow them with the hash tag @nunaat! For a complete range of Nunaat products, you can surf their site, and also interact with them on Facebook, which for your convenience you can also find HERE! I have adored my experience with these products and hope to try more in the future! I hope you do, too! Disclaimer: Mom's Gone Bronson was not monetarily compensated for this review but did receive the products mentioned for the integrity of this review. All opinions are open, honest and the writers own and your opinions and experiences may differ! Thank you! I too am very skeptical about Keratin products. Some work nice and some downright leave my hair worse than it was to begin with. This stuff sounds wonderful and can't wait to try it. I've heard of this stuff, it looks great! This is fabulous stuff! Thanks for sharing.